Great Scott! I was one of the lucky ones who got to go to the Secret Cinema screening of my all-time favourite film, Back to the Future. Anyone who knows me will know how obsessed I am about the film, from my iPhone case, to my ringtone, to collecting memorabilia, and also having the film on various formats. I even got my husband Mark, to put Back to the Future 1 and 2 films together by blending them onto the same VHS so I could watch both films in one go! And my long-suffering husband refuses to watch the films with me as I know them word for word. So yes, obsessed is the word. I had high expectations, after the disappointing news last week that the first week of shows had to be cancelled. Fabien Riggall, founder of the immersive film-experience company, said it was a 'myriad of reasons' for his decision to cancel the first week. Many people took to social media to express their anger, and I could understand as people had paid for tickets, hotels, bought special fifties outfits, come from far and wide, so I had sympathy for them. Along with my daughter, Amber, we were all dressed in fifties gear and met at Hackney Wick station. As it's Secret Cinema, you never find out the details of the events and are just given a place to turn up and will be directed when you arrive. After a 15-minute walk we arrived at the entrance to the Olympic Park, only a venue of this size could cater for what we were about to experience. I just wish we could have met at the Olympic Park, as Hackney Wick station is a little awkward to get to. People who had mobile phones had to give them in at the entrance, as mobiles weren't around in 1955, but it was really so pictures of the event didn't get out and spoil it for others going to the following shows. The experience started with a walk down Riverside Drive, where there were houses from some of the characters in the film, a little disappointed with these as they were just a one room, large shed with not much inside, yes I realise they can't build full-size houses! Walking past 1640 Riverside Drive, we looked into Doc Browns house, some nice touches in there. As we entered the Hill Valley square, I was blown away. Full-size clock tower, over 30 buildings including, Hill Valley High school complete with Enchantment Under the Sea dance inside, plus a very good actor playing the part of Mr Strickland. Also in the square were familiar shops from the film, the Texaco garage, Lou's diner, Roy's records, and of course Ruth's frock shop. Everyone who registers are given a character, I was so please to be working for the Hill Valley Telegraph, and wore my press pass with pride. Amber was a student at Hill Valley high. As we walked around taking in the sights, it was great to see almost all of the 3,500 people had made the effort to dress up, and that really made it fell like you were in 1955. There was also a fair, complete with a ferris wheel and stalls. As the doors opened at 5.30 and the screening didn't start until after 9pm, it was quite a long time, but we made a little base camp on the green in preparation for the film. 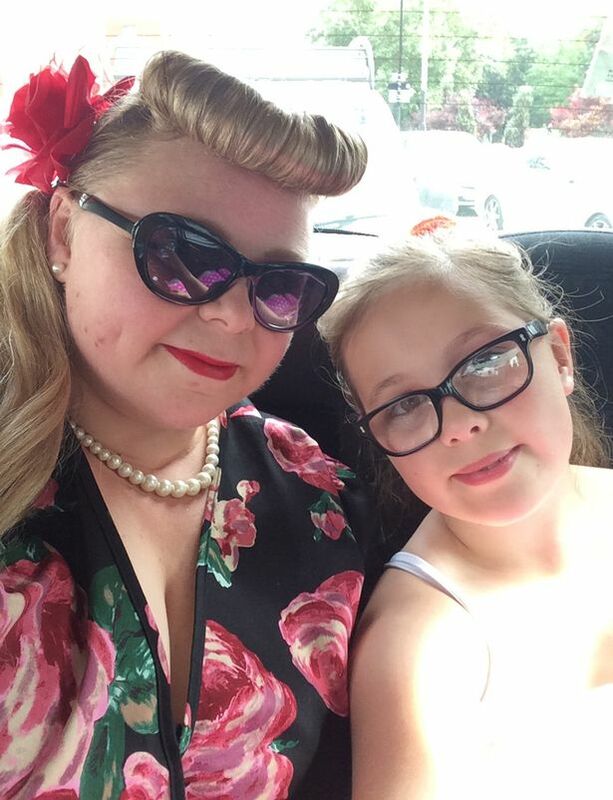 Adele and Amber all dressed up for the Back to the Future Secret Cinema event. It was a shame we had to wait so long for food in Lou's diner, over an hour, and the toilets were ones like at a festival! But that aside, it was fantastic. As the sun started to set over the Olympic park, the film began, to cheers from the crowd who all now sat on the green in the middle of the square. The film was projected on to the clock tower so everyone had a great view. At key points in the film, actors dressed as the characters treated us to some great scenes. As soon as I saw the DeLorean come out from backstage in a cloud of smoke, I knew this was going to be good. I wasn't disappointed at all, and loved every minute. I loved the audiences reaction to certain scenes, enjoyed having a dance to Johnny Be Good and it was great to be with people who loved the film as much as I did. Secret Cinema, I look forward to you putting on Back to the Future 2, next year as it will be the year Marty travels to in the future! I'll have my own hoverboard by then (I wish).